Eaglemoss presents the Alien and Predator figurine collection! Your favorite characters from the sci-fi franchise are meticulously rendered 1:16 scale, standing approximately 6 1/5-inches tall. 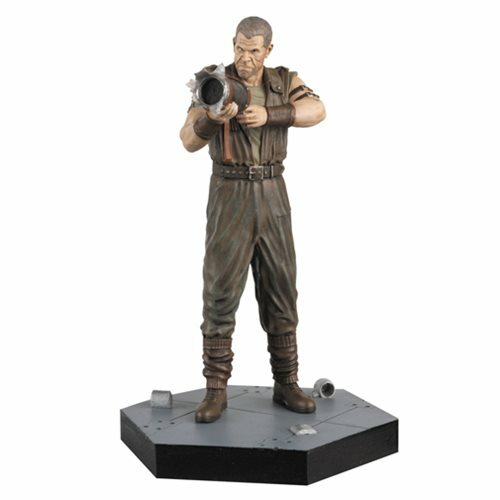 This Alien Resurrection Johner Statue comes with the volume #12 companion guide that explores the character. Ready for attack, the Alien and Predator Alien vs. Predator Alien Resurrection Johner Statue with Collector Magazine #12 is cast in metallic resin and hand painted. Ron Johner is an immature and aggressive bully paid to kidnap human subjects for use in lethal experiments. He's also brutally honest, fiercely loyal, and exactly the kind of guy you need during an alien outbreak. Johner, portrayed by Ron Perlman, is one of the few people to escape the xenomorph infestation on-board the USM Auriga in 1997's Alien Resurrection. The statue shows the mercenary moments after unleashing his improvised weaponry on some unsuspecting security agents trying to take down him and his crewmates. Ages 15 and up.